Well hello there, friend! If you’ve been visiting the blog then you know this Slow Cooker Breakfast Casserole recipe is my first recipe to post in about two weeks. Goodness, we’ve just been so busy! Spring has sprung around Central Arkansas and with that has came so many spring projects, my head is spinning. 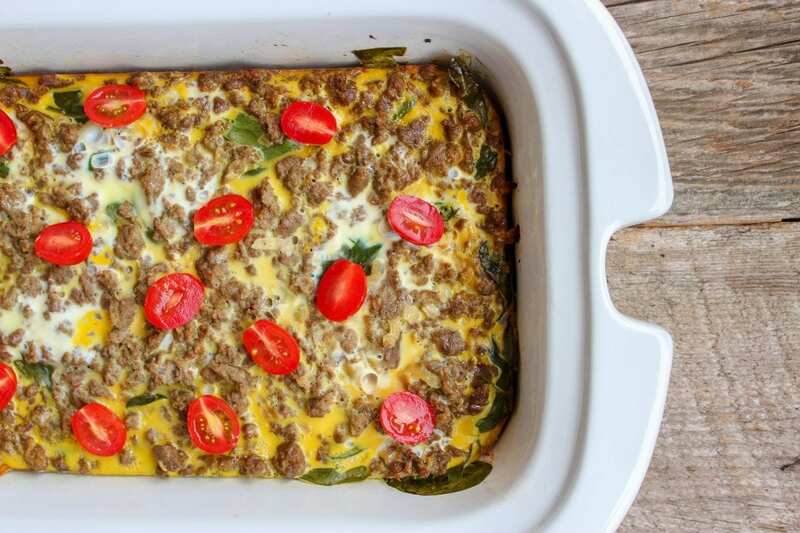 It’s a cool and rainy Saturday around these parts, so I figured, what better day to get some blogging done and give y’all this great Breakfast Casserole recipe. Mornings are a busy time for us so I like to keep fast breakfast options on hand. Anything I can cook on a weekend and heat up throughout the week is a win around my house! 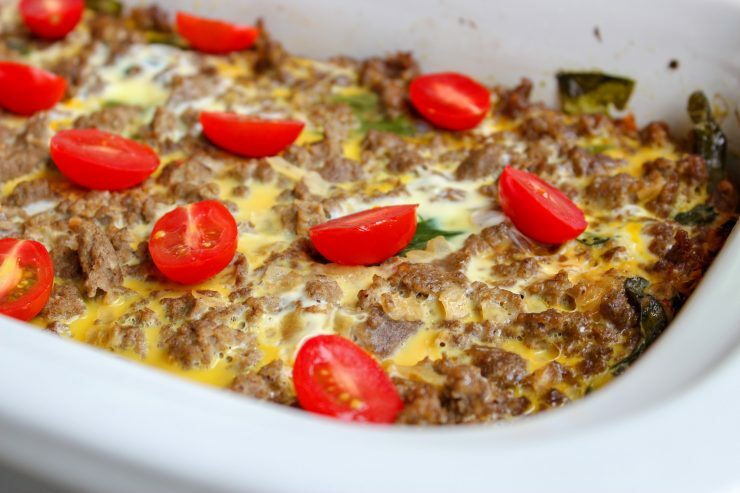 Grab your slow cooker and put it to work for this delicious and nutritious Slow Cooker Breakfast Casserole! I started out with my 9×13 casserole Crockpot, but you can use a 6 quart oval Crockpot if you don’t have this type. Spray the bottom and sides of your slow cooker with nonstick cooking spray. This will make clean-up easier! Peel and shred one medium sweet potato with a cheese grater and sprinkle them into the bottom of the slow cooker. These sweet potato hash-browns will serve as your first layer for this amazing Breakfast Casserole. Now that the hash-browns have been added, sprinkle 1 1/2 cups of fresh baby spinach on top. If you’re looking for ways to incorporate more greens into your breakfast meals, this is a great way to do it! You’ll notice here that I haven’t added any dairy – this is a completely dairy free breakfast casserole but it can be added if you desire it. Now that your vegetable base has been added, it’s time to cook the onion and turkey sausage. Add 1 teaspoon of extra virgin olive oil to a large skillet and heat until hot. Peel and dice a yellow onion and saute it in the oil until translucent. 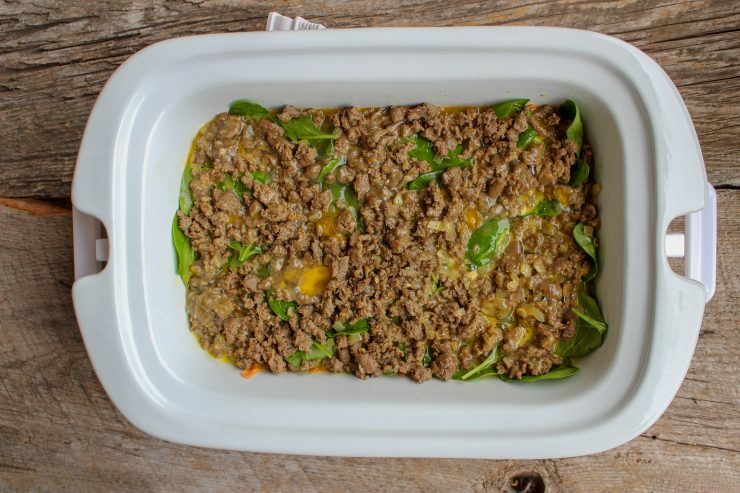 Add in the 1lb roll of ground turkey sausage and use a spatula or meat masher to break it into small crumbles as it cooks. Once the turkey is cooked through, drain off any grease and add the cooked turkey and onion to the ingredients in the slow cooker. 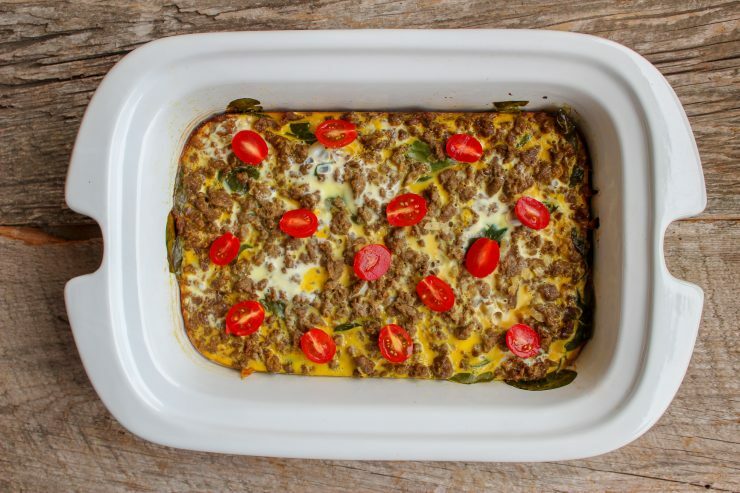 Farm-fresh eggs makes this Slow Cooker Breakfast Casserole delicious! The inspiration for this meal came when my neighbor gave us nearly 2 dozen farm-fresh eggs one morning. When you have farm-fresh eggs, you just have to make something fabulous with them! I used 14 of those eggs in this casserole and I think they just made it fabulous. While you don’t have to use fresh eggs, they certainly are wonderful if you have them on hand! Whisk 14 eggs in a large bowl with 1/2 teaspoon of salt and 1/2 teaspoon of pepper. Pour the whisked eggs over the ingredients in the slow cooker. Place the lid on the slow cooker and cook on high 3 hours or low 6 hours. 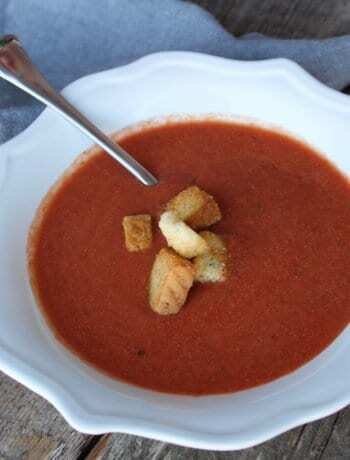 Cut the casserole into 8 equally sized squares and garnish with sliced cherry tomatoes or diced avocado. 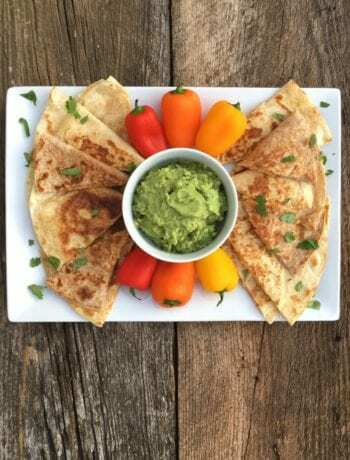 Can also be served with my fresh Blender Salsa or some hot sauce for an extra flavor punch. I’m a Frank’s Red Hot girl and an “I want all the condiments” kinda person, so I loaded my slice down – it was incredibly tasty too! 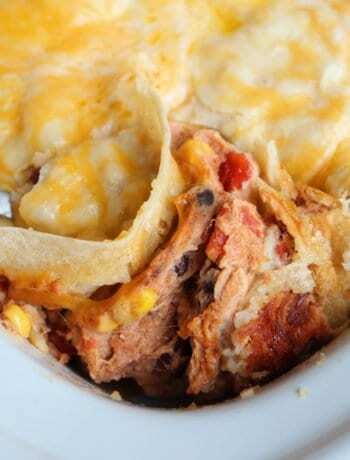 Storing and re-heating this Slow Cooker Breakfast Casserole is easy! 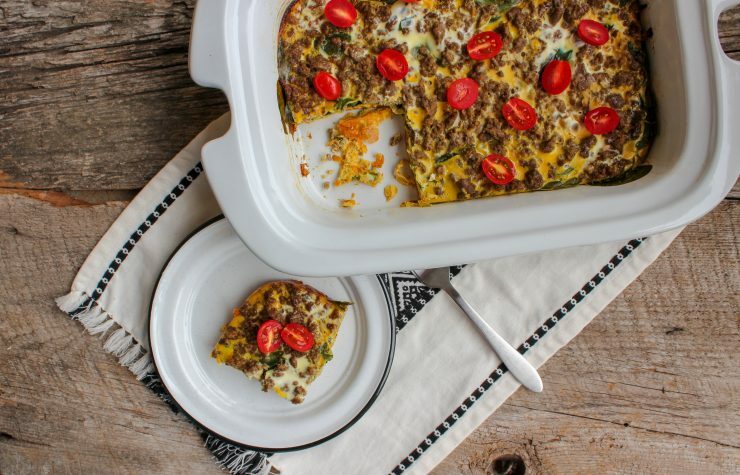 This Paleo Breakfast Casserole is so good re-heated that it makes the perfect breakfast meal-prep recipe. I like to portion out the leftovers into small, airtight containers that are microwave safe. For a fast breakfast on the go, simply pop your container in the microwave for 1 minute to heat. If you’re doing a Whole30, you’ll be happy to know this Breakfast Casserole is Whole30 compliant! Just read the ingredients on your turkey sausage to make sure it doesn’t have any sneaky sugar. Well friend, I’ve enjoyed our time together today and I hope you’ll come back soon for another great recipe! 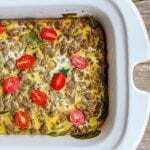 An easy breakfast casserole that's full of nutritious ingredients to keep you full all morning long! Place the olive oil in a skillet and heat on medium heat until hot but not smoking. Peel and dice the onion and add to the hot oil, sauteing until translucent. Once the onion is cooked, add in 1lb of turkey sausage and cook until browned and cooked through. Use a spatula or meat masher to break into small pieces as it cooks. Drain any grease the turkey cooked out and set aside. Peel a medium sweet potato and shred using a cheese grater. Spray the inside of a 9x13 casserole slow cooker or a 6 quart oval slow cooker with nonstick cooking spray. 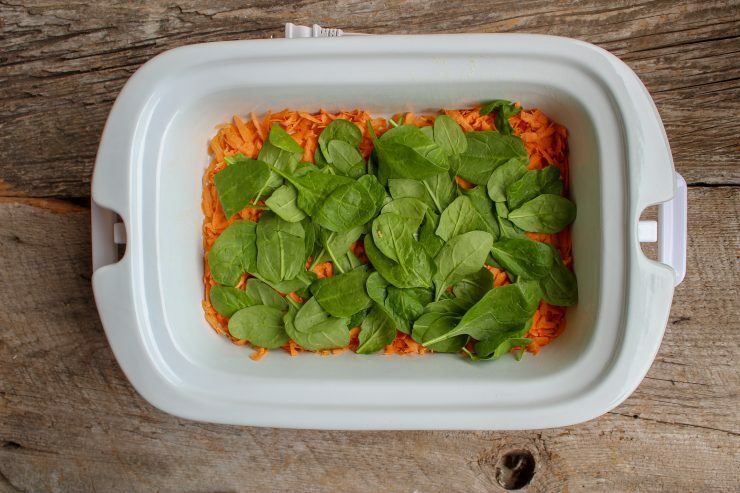 Spread the shredded sweet potato on the bottom of the slow cooker, then add the spinach leaves. 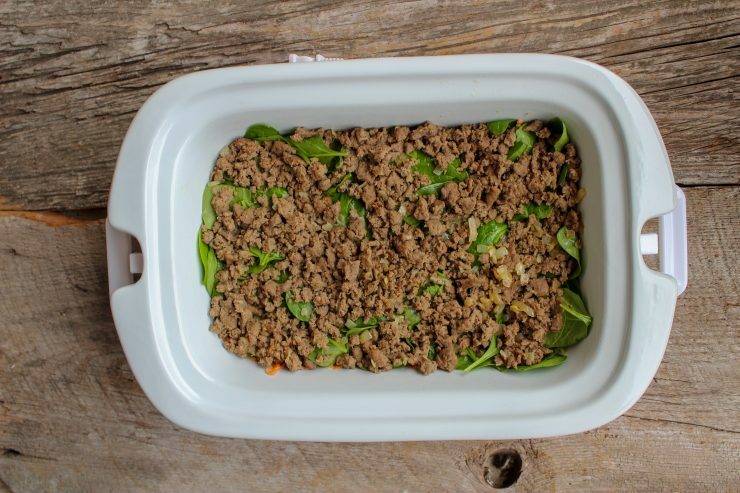 Top the spinach with the cooked ground turkey and onions. Crack 14 eggs into a large mixing bowl and season with the salt and pepper. Whisk until fully beaten and combined with a whisker. Place the lid on the slow cooker and cook on high for 3 hours or low 6 hours. Once cooked, turn the heat off and top with sliced cherry tomatoes or diced avocado for garnish. Can also be served with salsa or hot sauce for a little extra spice. 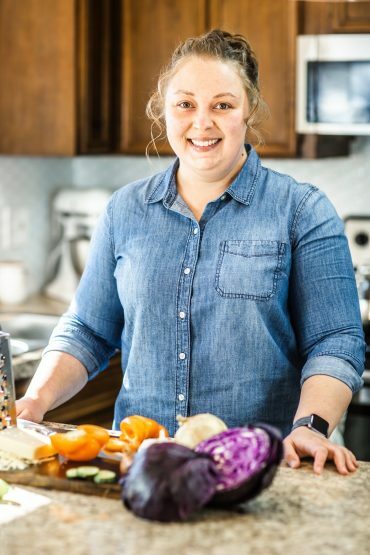 This casserole is great for meal-prep because you can portion it out and easily re-heat it in the microwave the next day for a fast breakfast or lunch. Will keep in the fridge in an airtight container for up to 4 days. Nutritional information calculated using Jenni-O's 1lb packaged roll of seasoned, ground, turkey sausage. Nutritional information is for the casserole only and doesn't include optional garnishes. This looks like a great make ahead breakfast that my hubby can bring to the office throughout the week. It really is! We love it for leftover breakfast throughout the week!